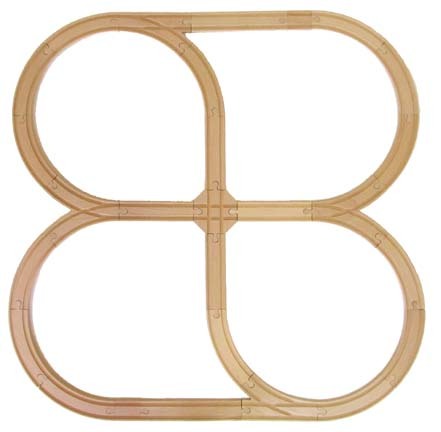 The Cloverleaf Wooden Track Set will let your child direct the busiest of train traffic. Hand crafted & sanded smooth, the quality of these wooden tracks are of the highest standards for size & fit. Wooden trains run very smoothly on these tracks. Made of solid beech hardwood. Size = (33" x 33 1/2") This 27 pc. set consists of 14 - 6" curves, 4 - 6" straights, 2 - adaptors, 2 - 2-way switches, 2 - 8" straights, 2 - 6" switches, and 1 - intersection crossover.